This SPECIAL EDITION is a physical copy of Castle Doomenstein burned onto glorious CD-ROM technology. Castle Doomenstein is the first completely pointless text adventure game written, programmed, and published by Erik Radvon. 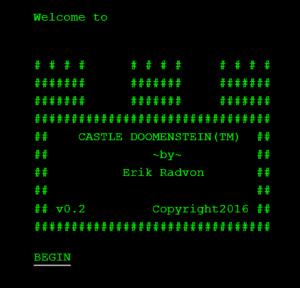 Featuring minutes upon minutes of exciting text gameplay action, Castle Doomenstein is an experience for fans of Interactive Fiction and classic text adventures. Explore a desolate mansion, visit a convenience store in the underworld, negotiate with demons, and fight off an evil wizard!